I love cameras — plastic ones, underwater, paper, and disposable; although I never really throw them away. I wrote a little while back about the Truck Pinhole Camera this is a smaller version of that fabulous low tech adventure of photography. 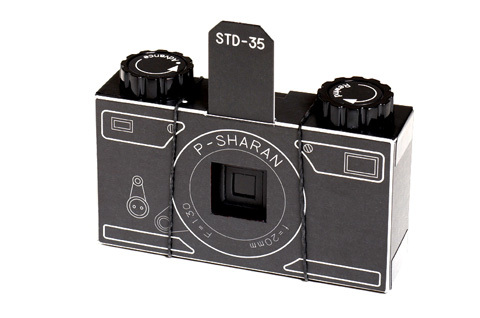 This is the STD-35 pinhole camera. Crafted in Japan, this is a do-it-yourself pinhole camera in a league of its own. First off, it uses the easy 35mm film & normal development that we all know and love. As with all things pinhole, you’ll get dreamy soft focus images with straight wide-angle lines and endless depth of field. Its 20mm angle of view captures a fat & wide chunk of everything in front of the camera. It’s constructed of sturdy 1mm paper card, secured with rubber bands, and includes all the tape and fixins that you need. We clocked about 1 hour from unpacking to complete assembly. Not to mention, this little guy is cute as a button and unbelievably functional once it’s all put together. You can get one at the lomo pinhole camera store. As much as I love taking digital photos there are some amazing things that happen using these little film cameras that you can get at the lomography store. 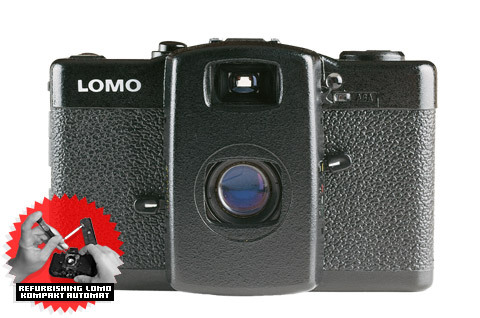 If you don’t know about Lomo or the crazy band of cultish photo folks that use them beware. If you see these really sweet cameras you’ll be spending lots of cash collecting each and every one. They are wonderful toys. My addiction started with the action sampler seen below. I own the clear one below and a black version of the action sampler milk [the white one]. These take four exposures on one frame of 35 mm film; about a second apart. Terrific fun. Like having your own photobooth you can carry around. Occassionaly things get very wierd with double exposures and the like… the opportunities for the unexpected are limitless. I also have a groovy vertical four exposure version too. It’s bright yellow. Then I had to move up to the LOMO KOMPAKT. This is a a fabulous little Russian camera. It was what really got me crazed. This isn’t one of those little plastic cameras… you can get a refurbished one these days. Check out lots of Lomo action at flckr there is a huge LOMO community there. 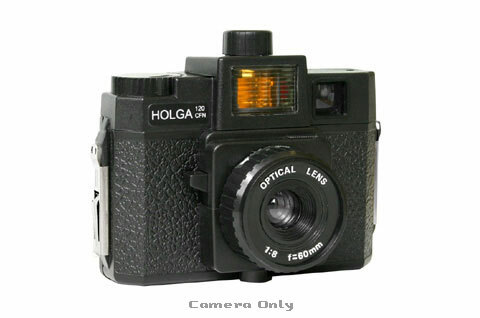 Then the Holga a 2.25 x 2.25 plastic camera. This is probably the biggest challenge of the bunch. It always has light leaks and you may find yourself using tape to try to seal the little spaces at the seams. Still its great fun. This image is of the flash version. I have the original. No flash for me. These are some of my good friends I hope you enjoyed meeting them. Google LOMO, you have hours of fun. Visitors looking at work in my open studio. It’s really interesting how this all works. 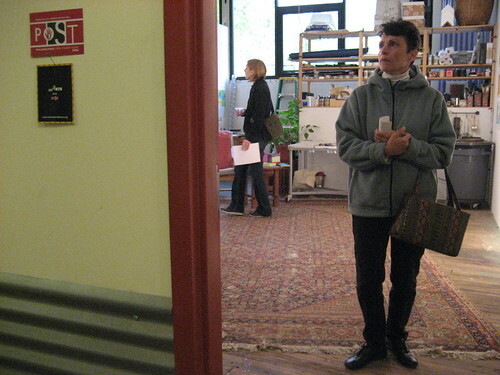 If I sit or stand in my studio waiting for visitors to arrive they look in and pass by… but if I step away, maybe visit another artist in the hallway — people wander in. I tested this numerous times throughout the weekend. Sometimes I sat in the studio and a passerby would stick their head in the doorway. Some wouldn’t even break the plane of the space in the doorway. If I waved them in they would walk on by. What was this moment of indecision all about? Did they feel as uncomfortable as I did? Did they want to look at my work without me there? Did they want to talk about the work and not have me overhear? In this image, which I took while standing outside the studio, people seemed quite comfortable wandering around the space and looking at the work. The only thing I could do was disappear. Then they weren’t concerned in any way. This isn’t to say that people didn’t ask me questions about the work. There were many folks that thought my drawings were prints. Several asked about how I actually made the different marks. Many were intrigued by the techniques used. We have been back from our vacation in the woods for almost two weeks now. The pace of life has changed and this is the first time I have had to write about the trip. Each morning began with a simple ritual. Sleepy eyed and rumpled I put the the kettle on the stove to make the coffee. 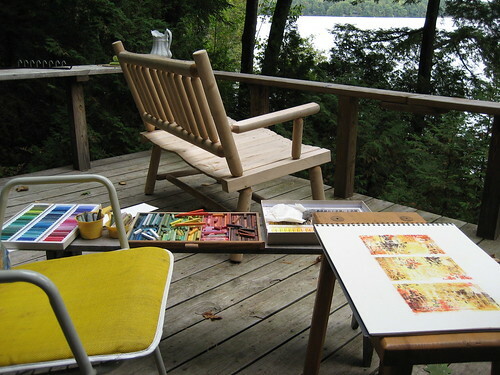 While waiting for the water to boil and after the obligitory trip to the outhouse was made I would assemble my drawing materials on the deck positioning for a new view each day. By the time the coffee was ready the sun offered enough light to consider making a drawing. The plein air experience created a whole new set of marks and approach that I hadn’t tried before. It yielded different shapes and textures. It was a fabulous experience to make drawings outside. Much has to be considered to create a workspace that allows for spontaneity and order. The image above is a typical set up for the nearly two dozen drawings I was able to make. I don’t know about you but I love skype and the Netgear’s Skype Wi-Fi phone makes it all a little better. Just be in range of a Wi-Fi signal and this Nokia 3120 doppelganger functions like your average mobile phone. You are invited to my studio during Philadelphia Open Studio Tour [POST] for smARTS does POST weekend..
Come see my new work, have some tasty bits, bring old friends and meet new ones. More than 16 of my fellow artists will be participating so there’s plenty of art to see and experience. Ceramics, glassblowing, fused glass, stained glass, textiles, painting, and of course drawings. 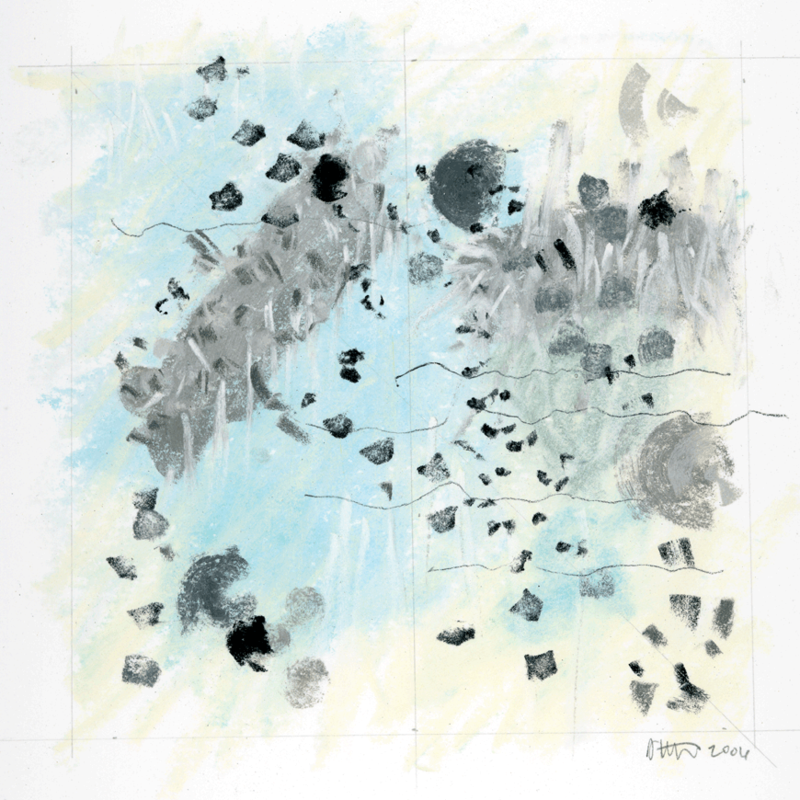 This image is one of the nine drawings in my stones series from this summer. Also, drawings from the cosmic plains series drawn on black surfaces which were selected for the Contemporary Works Show, and the latest from my yearly pilgrimage to the Adirondacks. I’ll be in the studio from noon until 6 pm both Saturday and Sunday October 7 and 8. At 5:15 there will be a dedication of Kate Kaman’s Growth Rings sculpture at Sherman Mills. This is a breathtaking addition to the local skyline.